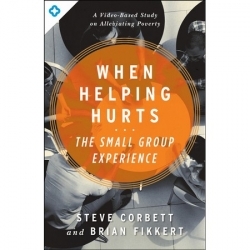 The Small Group Experience, an ideal training resource for small groups, Sunday school classes, and parachurch and nonprofit ministries, unpack the basic principles of poverty alleviation in an accessible way, Each of the six lessons includes discussion questions, application exercises, and materials for further learning. Join the many ministries and churches that are already implementing these ideas, transforming their culture of poverty alleviation, and moving toward helping the poor without hurting them. "For over fifteen years I've worked alongside other Christians in efforts to effectively address poverty at home and abroad. I can honestly report that When Helping Hurts is the single best book I've seen on this topic.." - Amy L Sherman, PhD, Senior Fellow and Director, Sagamore Institute Center on Faith in Communities; author of Restorers of Hope . "Corbett and Fikkert fill some important gaps in our thinking and acting about poverty as Christians. Churches in North America will find this a helpful way to educate congregations and then motivate them to action, both globally and in their neighborhoods.." - Bryant L. Myers, PhD, Professor of International Development, School of Intercultural Studies, Fuller Theological Seminary. "Steve and Brian have rung the bell - a clarion call to rethink how we apply the gospel to a broken world. When Helping Hurts lays out the principles and practice for transforming our good intentions into genuine, lasting change. I couldn't recommend this book more highly." - Stephan J. Bauman, Senior Vice President of Programs, World Relief.